Jesus who died shall be satisfied, And earth and heav’n be one. Amen. Words by Maltbie D. Babcock. Many of us have sung these words at church services across the nation, but how many of us know that less 120 years later, Tibetan lamas built a sand mandala at Auburn Theological seminary where he went to school. All of this in honor of the Dalai Lama’s being awarded the Congressional Gold Medal by the US Congress. How far we’ve fallen! Where are the Gatekeepers? Back in 1985, when I was working for Western Union Electronic Mail, yes they had a forerunner of it that transmitted through a modem, one of my areas of expertise was Crisis Communications for Corporations. It was well known that most CEO’s in meltdown crisis situations had poor coping skills under pressure. In order to change that, they would develop crisis communication plans anticipating potential trouble spots in their businesses. What they studied were called Pro-dromes. Before a crisis occurs, symptoms set in that indicate that a person, or an organization are about to find themselves in a heightened state of emergency. Before someone has a heart attack, they have symptoms. Today, cities all of the world have practice drills simulating major disasters to see how their different departments might function under stress. Tibet in 700 AD, was not Buddhist. As Tantric Buddhism was failing in India as a result of “self-poisoning” and the iconoclasm of the Islamic Empire which was expanding in India through invasions wherein Buddhism was condemned as idolatrous under Sharia law. 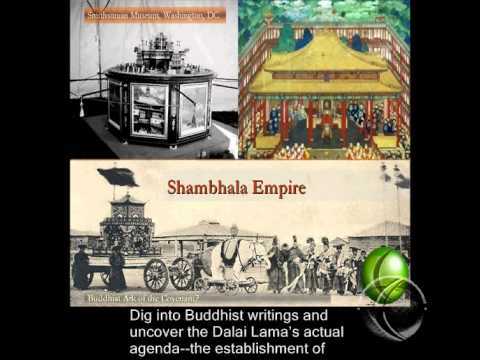 At that time, Padmasambhava, an Indian Tantric shaman fought a spiritual war of conquest over the Himalayan Mountains and subjugated the indigenous gods of Tibet’s Bon religion and assimilated them into the Tantric pantheon. He spiritually conquered Tibet. This would be a prodrome event that demonstrates the model through which Tantric Buddhism establishes itself in a new context. Bernie Wijesiriwardena, a former Buddhist from Sri Lanka who himself descended from a 550 year lineage of Buddhists prior to coming to Christ, stated that “the Buddhist process of assimilation takes place over an eighty year period.’ The alliances the Tibetans are making with First Nations is in alignment with their plan of spiritual conquest as they establish their Shambhala Empire. Here’s a thumbnail sketch of my theory. As a militant Islamic Empire subjugated India and forced Buddhism underground and resulted in many conversions to Islam, it forced Tantric Buddhism over the Himalayas where it spiritually subjugated indigenous Tibetan peoples who became Tantric Buddhists who’d incorporated elements of Bon, the traditional animistic practices of Tibet. As idolatrous Tibetan Buddhism prospered and ruled Tibet as powerful landlords in a feudalistic system, YHWH, found Tibet’s practices abhorrent as they defiled the land and people and sent missionaries who were sincerely sharing the Good News of Jesus Christ to give them an opportunity to repent. As they rejected the truth, YHWH, gave them over into the hands of a greater power for chastening. Then in a desparate quest to protect Tantric Buddhism’s mysteries, another country helps their chief leader, the XIV Dalai Lama escape. Over time, the Dalai Lama seeks to propagate Tantric Buddhism and seeks counsel from his shaman, the Nechung Oracle. Padmasambhava’s prophecy speaking of the scattering of Tibetans like ants to the land of the Red man becomes their guiding star. The US Government which held to a Hellenized Christianity which was became syncretistic under Constantine, who basically conscripted Roman gods, temples, and holidays and Christianized them, gave birth to Roman Catholicism which was the Roman Empires new ideology motivating their conquest. As important as the Protestant reformation was in holding to the doctrines of grace and the priesthood of all believers, it was still tainted by the Constantian syncretism as it misappropriated Christianity to conquer “heathen and pagan peoples by force.” Persecuted Christians that settled America and held to the Free Church originally fought this trend, but those in the Government used Christianity to justify Manifest Destiny and through it began to conquer First Nations using their military power and using Christianity as an implement of enculturation. Treaties were made in the Name of Jesus Christ. They were covenants. Over 900 were broken and lands were stolen, justified in the name of Manifest Destiny, misinterpreting Scripture and brutally murdering many trusting stewards of Turtle Island. Tragically, while desiring to protect the Faith, many who fled to America as religious refugees and fought for the ideal of religious freedom and liberty did not extend that to those they considered heathen or pagan, the stewards of Turtle Island, the First Nations. Not many realize that the China actually utilizes our model of manifest destiny as a model for subjugating the Minority Peoples of China, including the Tibetans. First Nations’ Christian leaders recognize this as a great theological error. That is another lesson. Continuing with my thumbnail theory. In America, Christianity allies itself with secret, and not so secret societies like the Freemasons, which assimilate elements of Christianity, but defile it in truth. As American Christianity apostasizes, it opens the door to Tibetan Buddhism. When I was growing up in Montana, sheep farmers had a gruesome way to protect their flock from wolves and coyotes. They would bury a wooden stake in the ground to which they would tie a wire hooked to a razor blade frozen in ice and covered with blood. The coyote/wolf would be attracted to the blood and lick the deadly Popsicle. As they did so, their tongue would be desensitized to the razor blade that was cutting their tongue and then they began drinking their own blood ending in their eventual death. Just like the Apostle Paul warned, ‘there are vicious wolves who have entered the flock. Unfortunately, many in the Church have licked the deadly Popsicle. We have become our own worst enemy. We have allowed ourselves to be deceived and have become blind and naked. Tantric Buddhists don’t know YHWH. That’s been their excuse up until now. American Christianity as it became more inclusivistic and pluralistic, apostacy set in and now Presbyterians, Baptists, Moravians, Methodists, invite the Tibetans to build sand mandalas in their institutions and churches in the name of “promoting culture” or “religious freedom in Tibet.” They even host the Buddhist Blood and Relic Tour in their sanctuaries as was done in First Presbyterian Church in Santa Monica, California. One Catholic I met at Fuller said “off the worship I’d worship the relic of any holy man, Catholic or Buddhist.” How shall they hear if we’re disobedient to share our faith? To hold fast to the faith delivered to the Saints. So who opened the door? Before you as a Gatekeeper know that a door needs closing, you have to know that it’s not all about the darkness of Tantric Buddhism, but sadly about the naiveté, lethargy, pride, disobedience, and the lukewarm condition and growing apostasy of a growing segment of the Church in America. We don’t take history seriously enough. And so what did our President do? Gave America’s Number One wanted Terrorist Osama Bin Laden the code name “Geronimo.” Does this show you how out of touch we are with our history? That religion, or the duty which we owe our Creator, and the manner of discharging it, can be directed only by reason and convictions, not by force or violence, and therefore all men are equally entitled to the free exercise of religion, according to the dictates of conscience, and that it is the mutual duty of all to practice Christian forbearance, love, and charity towards each other. SOUNDS ADMIRABLE, BUT. NOW READ THIS FROM A TECUMSEH’S POINT OF VIEW, AN HONORED HERO. Tecumseh in 1810 faced Governor W.H. Harrison to bitterly protest the land sales of 1805-1806. He said they were effected by the use of strong liquor, a breach of the Treaty of Greenville. He refused to enter the Governor’s mansion. “Since my residence at Tippecanoe, we have endeavored to level all distinctions, to destroy village chiefs, by whom all mischiefs are done. It is they who sell the land to the Americans. Brother, this land that was sold, and the goods that was given for it, was only done by a few…In the future we are prepared to punish those who propose to sell land to the Americans. If you continue to purchase the, it will make war among the different tribes, and, at last I do not know what will be the consequences among the white people. Brother, I wish you would take pity on the red people and do as I have requested. If you will not give up the land and do cross the boundary of our present settlement, it will be very hard, and produce great trouble between us. The way, the only way to stop this evil is for the red men to unite in claiming a common and equal right in the land, as it was at first, and should be now—for it was never divided, but belongs to all. No tribe has the right to sell, even to each other, much less to strangers…Sell a country! Why not sell the sir, the great sea, as well as the earth? Did not the Great Spirit make them all for the use of his children? How can we have confidence in the white people? When Jesus Christ came upon the earth you killed Him and nailed Him to the cross. You thought He was dead, and you were mistaken. You have Shakers among you and you laugh and make light of their worship. Everything I have told you is the truth. The Great Spirit has inspired me. Tecumseh, in July 1811, with twenty-four warriors, followed the Wabash River in a second attempt to engage in historic debates to persuade the Indians to unite in a southern confederation. He voiced prophetic warnings. PLEASE GIVE US Understanding and wisdom to overcome historical and theological breaches which have betrayed the Gospel of Yeshua and inoculated many First Nations, Tibetans, and others against the true faith found in YHWH. IN CONCLUSION. Before ending in prayer, here is a story which I hope encourages us to press on in the steps that YHWH has preordained out of His mercy and compassionate love for unreached peoples all over the world. Thanks to Caris Faith Sy. “Gladys Aylward, courageous and renowned missionary to China, shares a fascinating story in one of her biographies which exemplifies the hunger in man’s heart for love. Gladys and a companion, Dr. Huang, were traveling on a short ministry excursion. She relates that on the eleventh day, out of desperation the doctor prayed, “Oh God…we have witnessed to no one today, but you have sent us here for some special purpose. Show us where to find the man you intend to bless. When the prayer time ended, the two began to sing choruses. A few minutes later, they joyously sighted a Tibetan lama priest, who, to their surprise, cordially invited them both to spend the night in the lamasery. They were extremely curious, because lamas are supposed to have nothing to do with women. But, another even greater surprise awaited them. Suddenly, the lama stated clearly, “We have waited long for you to tell us about the God who loves. Gladys reports how her heart jumped when their new guide led them to a compound and invited them to speak to five hundred lamas! They sang and also spoke of the baby who was born in the stable and of the Savior who died on Calvary. Speaking on and on, interspersed with singing, they continued until well past the point of exhaustion. Finally, upon the verge of collapse, they both arose and left the great hall to retire for the night. However, rest was not yet to come. For upon retiring, Gladys was disturbed by lama after lama coming to her room, two by two. These men never questioned that God was the Creator of the World, they never doubted the fact of the virgin birth, they did not consider any of the miracles incredible. To them it was the wonder of God’s love which obsessed them. The story of Christ’s death on Calvary filled their minds with awe and reverence. And she received the most astonishing reply. That was all, but from it they had learned that somewhere there was a “God who loved.” Everybody read it and reread it or had it read to them. The head lama continued after I had read that important scrap of paper. The next year, when our men took the herb down to the cities they were told to find out where “The God who loved” lived, but for five years they could learn nothing more. Jubilantly they approached the small China Inland Mission station and asked the same question of the Chinese evangelist. He told them all he could, then gave them each a copy of the Gospels. While one went back to tell the rest of us to prepare for the long expected guests, the other came down to meet you on the hillside. The first time I read that I wept. They are waiting. Trusting that we, God’s disciples will be obedient. May we not disappoint them or our LORD Yeshua, Jesus Christ of Nazareth. Confession. As lead by the Holy Spirit. Prayer strategy of a mature Tibetan Christian minister. The enemy will try, through the Buddhist protective deities (demons), to generate fear and confusion over minds that try to pray. 1. Brothers and sisters need to be of one mind. (Phil. 2:1-11). 3. Be united in confronting the situation. (Phil. 2:2). For the salvation of Buddhists, even the Dalai Lama. (Ps. 2:1-12; Jer.18:1-17;26:13). For no enchantment of the listeners. That the Spirit of Truth would prevail in sharing the Gospel. That what the enemy intends would instead be multiplied for the Kingdom of God’s progress. That God would confound the devices and weapons of the enemy being raised up by this event and would use it for LORD Jesus’s Glory. For unity and a solid, loving evangelical witness of the Christian community to reach spiritually lost followers of Tibetan Buddhism. (Eph. 1:15-23; 3:1-6;4:29-32; 2 Thes.1:11-12). For a spirit of humility in our witness, that we, without Yeshua, our Savior Jesus Christ, we would be as lost as they. (Ephesians 2:1-4). Pray for a covering over all those who are preparing literature for outreach, and its timely publication. Pray for gatekeepers to take the worldviews101 intensive so that they can intercede with knowledge and understanding. Pray for us as we prepare the blog. For necessary finances, energy, clarity and wisdom and a spiritual and physical covering over our entire family and team working on this initiative. Thanks be to YHWH our Provider and Defender. May the Fear of the YHWH be released upon the Nation to bring us all to repentance before His Throne of grace. May the young bees be raised up in a spring swarm that is productive for advancing the KINGDOM OF GOD. May believers of every background be made aware of this initiative and become involved with their many gifts, talents and abilities. We are grateful to be part of YOUR KINGDOM O YHWH! Check out the life of Roger Williams who advocated for religious liberty SO THAT the Gospel could be preached among all peoples who came. Imperfect, he still planted the Gospel among Indians and defended the rights of Indians and for justice in treaties. That was why he was kicked out of Massachusets Bay Colony: He was so ardent for the evangelization of the tribes he worked with that he lived among them, wrote a catechism for them, and translated the Bible into their language. He also printed a dictionary for that language to promote understanding.